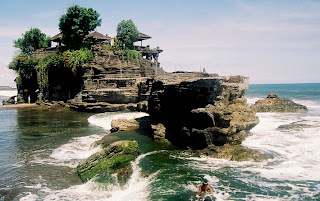 Tanah Lot is one of the favorite tourist attractions in the Bali island. Tanah Lot is present the stunning natural beauty that is hard to find a match. Ineffable beauty of this temple because the temple is located in the middle of the sea or separated from the mainland. Around this temple there are several other temples which are smaller, including the temple Pekendungan. At western section there are freshwater springs that are considered sacred by Hindus. While there are some caves underneath where in the lives of many snakes which large, medium and small in different colors. However snakes are not dangerous if not disturbed by visitors. If the tide is low then visitors can immediately go to the temple to pray, or simply enjoy the beauty of the beach. But if the sea water was high tide, the temple will look like a boat floating on water. Temple Tanah Lot founded in XV century AD by Pedanda Bawu Nirartha Rawuh or coming from the kingdom of Majapahit. 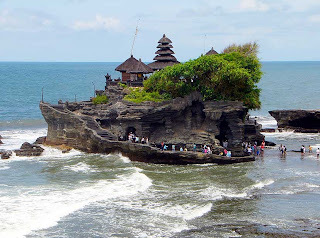 Temple Tanah Lot is located on the sea and separated from the mainland and around the Temple there are several small and big Temple such as Temple 'Pekendungan'. Below and to the west there is a source of fresh water which is water sacred by the Hindus. Temple Tanah Lot is part of "Sad Kahyangan". Temple Tanah Lot temple in the middle of the beach is a place of worship of the gods guard the sea. 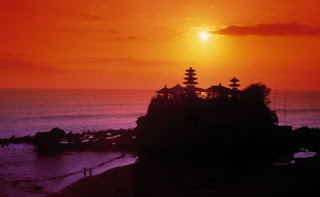 Tanah Lot is famous as a beautiful place to watch the sunset (sunset), usually the guests will come in the afternoon to see the beauty of the sunset. In this place, from the parking lot to the place of attraction / temple, there are many art shops offering local crafts products, many beverage and food stalls, there are also toilet facilities, which cost of rent is pretty cheap.